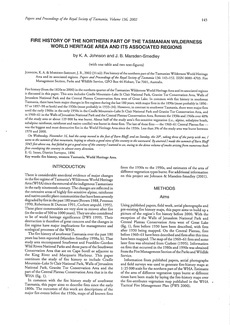 Fire history (from the 1820s to 2000) in the northern quarter of the Tasmanian Wilderness World Heritage and its associated regions is discussed in this paper. This area includes Cradle Mountain-Lake St Clair National Park, Granite Tor Conservation Area, Walls of Jerusalem National Park and the Central Plateau Conservation Area west of Great Lake. In common with fire history in southwest Tasmania there have been major changes in fire regimes during the last 180 years, with major fires in the 1890s (most probably the 1896-97 or 1897-98 or both) and the 1930s (most probably 1933-43). However, in contrast to southwest Tasmania, there were major fires until the early 1960s.